In this third of the series, I attempted to connect the Vice-Presidents of the Philippines in one big family tree (click the photo above to see the details). It would have been a bit easier now since 6 of our presidents also used to be Vice-Presidents (Osmena, Quirino, Garcia, Macapagal, Estrada, and Macapagal-Arroyo) and the previous article on Philippine Presidents already laid the groudwork for their connections. I almost succeeded in completing the Vice-Presidents' family tree save for one: VP Noli de Castro, try as I might, could not be connected with certainty to any of the other Vice-Presidential family trees. I am in the process of researching his ex-wife's and current wife's genealogies and see where it will lead us. In this meantime, this is what we have so far. It is quite amusing to think that some people have assumed I had an ulterior motive in writing the Genealogy of Power article because it made President Duterte appear like an outsider compared to most of the previous presidents of the republic. However, I have always held that Duterte's election as president is the first in a very long time (since President Garcia, at least) that a person who was genealogically distant from the ruling elite was voted into power by the electorate. I made this very clear in another previous article when I said that "Duterte's all encompassing, inclusive type of leadership was one major factor that catapulted him to victory - those from the countrysides and from the provinces are tired of being left behind." But what many have not connected is that I also made the same conclusion with Vice-President Leni Robredo, a woman who I did not vote for but nonetheless believed to be someone who is fresh, political-wise. In the same previous article I wrote that "Leni is also not a product of Imperial Manila. Her upbringing is of the province, so she definitely will complement Duterte's own provincial background. In fact, in 2015, she was proud to say that among the 3 vice-presidential bets (Senators Gringo Honasan and Chiz Escudero also have roots to Bicol) she is the only one who grew up in the province. This insistence on clinging to her provincial background is a tell-tale sign of her affinity to and advocacy for those in the countrysides." Which is exactly what the genealogical table above and the matrix of power below will show us. Just as I surmised that among the presidents, Digong is second to farthest from the bases of power in Imperial Manila, so is Vice-President Leni Robredo clearly an outsider among the Vice-Presidents. As seen in the matrix above, Leni Robredo has the farthest average connection, family-tree-wise, from the other former Vice-Presidents. Surprisingly, Sergio Osmena is the front-runner from among his fellow VPs with an average of 17 steps. Truly, Leni Robredo's provincial roots have almost guaranteed that her connections to the ruling elite would be quite far away. That is why I believe that if only President Duterte and Vice-President Robredo would set aside their differences and work together, they could achieve a lot. These are two people whose genealogies tell us they are outsiders; true, they still both come from the local elite (Duterte from Duterte-Durano-Almendras of Danao City and Robredo from the Gerona and Robredo clans of Naga City), but they have carved their own brand of politics not like those of their families. And if they worked together? What wonderful country the Philippines would most likely become! So, how did I connect these people? Let's begin with the Osmeña-Macapagal connection. Sergio Osmena's tree connects with Gloria Arroyo's through one of Osmeña's daughters. Unfortunately, this early on, the daughter's name is kept private. However, the tree further continues with the last name of this daughter's son, which is Valencia. So, using Concepcion G. Briones's book Life in Old Parian I discovered the daughter's name, which was Rosalina and who married Dr. Elpidio Valencia. But their son's name was still private, so I had to find another means to know this son's name since Briones's book only traced the Osmeña tree to certain lines. This Valencia son is married to a Revilla, whose name is also private. So I googled the last names Osmeña and Valencia and Revilla and was directed to 2014 Philippine Star Lifestyle article celebrating the 90th birthday of Rosalina Osmeña Valencia. In the same article, Sergie O. Valencia is mentioned as having a Tina Revilla as a spouse. Since the Macapagal-Arroyo family tree connects this private Revilla with an Armando Goyena as her father, another quick google search revealed that actor Armando Goyena has a daughter named Tina Revilla-Valencia. An IMDB article further validates this. The family tree continues to connect us to the Santos, then de la Rosa, and finally to the Macapagal family with all names already displayed. But while these names were all displayed, I still googled all names or checked other family trees to validate their connections. So far, so good. VP Osmeña also has another close connection, VP Emmanuel Pelaez. In the online family tree, the Osmeña-Pelaez connection is through Osmeña's first wife's family. The tree connects a "private" sister of Estefania Chiong Veloso, Osmeña's first wife, with the Villalon family. Once again, Briones's Life in Old Parian helped with the connection since the Chiong Velosos are also documented in the book. The book gave us the name of Estefania's sister, Eleuteria, whose daughter Genoveva married into the Villalon family. Because this was the only name made private, it was easy to follow the trail of relationship from Genoveva to her son Augusto, then connected to the Fabella family through his wife, then to Fabella's cousin, Edith, who married Vice-President Pelaez. Then we connect the VP Gloria M. Arroyo with VP Jejomar Binay, VP Laurel, and VP Guingona through both sides of her husband's family. First Gentleman Arroyo's father is from the Araneta clan of Negros Occidental, whose complete genealogy has been compiled by Roland Oscar Araneta (who shared their records with me in 2010). The Araneta genealogy connects various lines and generations of the family until we go down to Tonypet Araneta, who married former Ms. International Gemma Cruz. From here, we look into the Nakpil genealogy, also available online. Gemma Cruz Araneta's step-sister, Nina Angela Nakpil, married into the Campos family and one of her sons, Luis Jose Campos, married Abigail Binay, daughter of Vice-President Jejomar Binay. Meanwhile, on First Gentleman Arroyo's mother side, we trace the connection with VP Laurel and Guingona. The Tuasons, Arroyo's maternal family, have their genealogy discussed in the the article The Last Haciendera: Teresa de la Paz by Luciano P.R. Santiago. 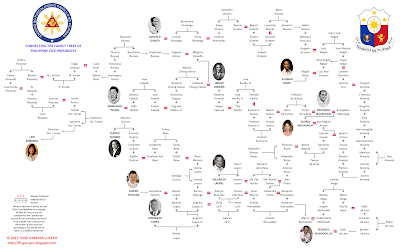 So we trace this line through the Tuasons, then through the Legardas, Roces, and Prietos, who on one side married into the Rufino family whose one member, Paz, married Arsenio Laurel, brother of VP Salvador Laurel, and on another side married into the Romualdez family (genealogy derived from countless books including Carmen Pedrosa's The Rise and Fall of Imelda Marcos and Imelda and the Clans: A story of the Philippines by Beatriz Romualdez Francia), whose one member married into the Kittilstvedt family. Once again the online family tree made private the name of the Romualdez who married Yedda Marie Kittilstvedt but her personal website gives us the name of Martin Romualdez. And so through the Kittilstvedt family, then the Atega, then the de Lara, whose one member, Ruth, married VP Guingona. The de Laras also have their genealogy privately compiled. Then we can go through the Romualdez family again and get connected to VP Fernando Lopez through the Manotoc-La'O-Lopez connection. Of course, this then would give us 2 more Vice-Presidents: one was Fernando Lopez, and the other is Erap Estrada whose daughter Jacqueline married into the Lopez clan. The Lopezes of course have their genealogies thoroughly discussed and documented. What I used was Alfred McCoy's An Anarchy of Families: State and Family in the Philippines, Phoenix: The Saga of the Lopez Family by Raul Rodrigo, and countless church records and other sources. Still through the Manotoc connection we can further connect VP Elpidio Quirino which takes us through the Mayuga, Lucero, Besa, then Quirino connections. Finally, we connect the current Vice-President, Leni Robredo, through a long line: we start once again with one of Osmeña's daughters, connecting with the Alonso, Reynes, Veloso, Noel, Arriola, Pimentel, Requejo, and then Sto. Tomas families which ultimately landed us with Apolonio Sto. Tomas, grandfather of VP Robredo. I think one can get the idea of how easy it is to connect family trees. As long as you have the patience and the nose to sniff out clues, then you can connect just about any family tree you want. As always, enjoy tracing family trees. 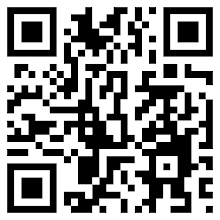 And if you found this helpful, please like my Facebook page!